The Royal Ulster Constabulary (RUC) has been Northern Ireland's police force for the better part of a century. Before the partition, the police force on the island was the Royal Irish Constabulary. But when Ireland became the Free State, the British government in Northern Ireland made the executive decision to squash the civil unrest that had broken out by forming the RUC. June 1st, 1922 the Royal Ulster Constabulary was officially formed. It would be the main police force in Northern Ireland for the next seventy-nine years. The first twenty years were fairly slow for the RUC. Though a normal police force, it had a secondary objective; it was meant to be a special group to protect the country from IRA attacks. The Special Powers Act made arrest without warrant, internment without trial, and unlimited search power available tactics for the RUC. The RUC did not fully engage in the conflict until 1968 despite the fact there had been IRA attacks during the previous two decades. For some this point marks the beginning of the Troubles. On October 5th, 1968, the citizens of Londonderry (known to the nationalists as Derry) marched for civil rights. The march was banned by William Craig, Minister for Home Affairs, which only made more people join the crowd. This excessive force may be due a change in the officer's perception. Rachel Macnair brings the up idea of a sensory vs. mythic perception of reality.3 The sensory perception, everyday life, is when a person's surroundings are being taken in and analyzed by the senses. The mythic perception is most often found in cases of war; "the rules of understanding what is going on change, qualitatively and dramatically. Reasons that make so much sense in sensory mode are quickly forgotten. "4 The march in Derry wasn't a time of war, but the perception of the officers changed and everyone became an enemy. This change in view may have been caused by another psychological cause of violence that Macnair discusses. This cause is destructive obedience to authority; when a person receives an order from someone in authority that person will, more likely than not, carry out that order even if the means are violent. The RUC in Derry on October 5th, 1968, would have received word that the march had been band and their orders would have been to stop it "within the law." The RUC's main objective was to stop the march. They tried, and some of the marchers threw stones putting the RUC into a threatening situation. This coupled with a strict order from their superiors put the RUC officers in a position in which their perception of reality changed. Although, the forced used by the RUC on the marchers was excessive and possibly done with full awareness of the casualties. Whether this officer had a mythic perception or a rage fueled by hate cannot be known but the 90 percent Protestant RUC did make their beliefs clear during later encounters. Perhaps another factor in the police brutality seen during the Troubles is the anti-social personality. The anti-social personality enjoys destrictive behavior, and these types of people are often drawn to professions such as policing. Less than a year later another march was going through rural Derry county. At Burntollet Bridge loyalists ambushed the marches. They threw stones and assaulted men, women, and children alike. This time the RUC wasn't creating the violence; instead, they stood by and watched. It is said that some of duty members of the other police force (B Specials) were among the attackers. These events led to an increase in Catholic support of the marches and demonstrations. The RUC, with only 3,000 men in Northern Ireland, were unable to cope with the growing unrest. By this point eight people were dead; four were killed by the RUC and one by the B Specials. The 3,000 men in the police force were worn out and injured. Unable to handle the crowds a request was sent to London to send the military; the Catholics were relieved by the arrival of the soldiers. Stories about B Specials and RUC officers joining loyalists in battles with Catholics spread. Because of these reports the B Specials were disbanded and the RUC lost more credibility as support for the nationalists grew. The RUC officers may have simply been trying to do their duty as best as they possibly could. This could also explain the excessive force used by the RUC in the face of strict orders. Or some of them may have said this to hide their discrimination. A few months after the Battle of the Bogside, RUC reforms were recommended and a new constable was appointed to "modernize the force. "12 Loyalists protested these reforms and during one of these protests and RUC officer was killed; he was the first member of the force to die in the Troubles. In 1970, two RUC officers became the first killed by the IRA. A year later Operation Demetrius (a massive arrest operation) commenced and 340 arrests were made in the first "swoops." It soon became clear that the RUC Special Branch had outdated information on the IRA leaving them with no idea how big the group actually was. The false information coupled with the army's eagerness for violence created an atmosphere of chaos where non IRA members were arrested. Not long after the arrests was Bloody Sunday. The army was responsible for the death of thirteen civilians. This took the RUC out of the conflict as their information was faulty and the IRA was now focused on the army. During the UWC strike, the Ulster Defense Association encouraged workers to strike. Blockades were set up and the loyalist controlled power stations were reduced to 60 percent output forcing businesses to close; both the army and the RUC did little to control the power or the roads. One any particular day of the strike, 2,000 officers and soldiers were responsible for keeping fine main roads into Belfast open. The next few years saw an increase in IRA as well as loyalist violence. In 1978, Amnesty International concluded that the RUC did maltreat suspects enough times to warrant a public inquiry. While a judicial committee investigated the allegations, a police doctor admitted to seeing a large number of people "physically ill-treated while in custody." At the end of the investigation, no charges were made against the RUC. In the early 80's the security forces in Northern Ireland had to find some way to react to the escalating violence. The RUC created it's own special forces unit trained for violent encounters with IRA and INLA. This new branch was known as E4A with an approach based on "speed, firepower, and aggression. "14 In the first month of it's creation, E4A was involved in three separate incidents killing six people. Of the dead, three were IRA members, two were INLA members, and one was a civilian youth. All six were unarmed when shot. The three IRA members were killed when police unloaded 109 shots into their car. These events became known as "shoot-to-kill" incidents and controversy has surrounded them ever since. Three officers were charged with murder in the case of the three IRA men. The officers were acquitted and personally congratulated by the judge that presided over their trial. Due to their controversy the Deputy Chief Constable of the Greater Manchester Police was sent to investigate the shootings; he was taken off the case when disciplinary charges were brought against him. Before he was dismissed, he reported that his investigation had been obstructed. Although there was evidence showing officers attempts to sabotage the case, no prosecutions were made. In addition to questionable killings, the security forces in Northern Ireland began using the supergrass system. This entailed former members being offered a new life outside of Northern Ireland in exchange for information on their comrades. Twenty-five supergrasses led to almost 600 arrests. In order to combat these new tactics the IRA began smuggling weapons in from Libya. Neither the RUC or British intelligence agencies found the Libya link and the IRA was able to attain heavy arms. With these new weapons the IRA came out with more violence and, in one instance, killed nine RUC officers when a mortar hit the grounds of a station in Newry. In 1987, the IRA tried to attack a small RUC station. Eight IRA members were killed during the attack due to the waiting SAS soldiers. The early 90's also saw an increase in violence from all sides. An off duty RUC officer posed as a reporter to infiltrate a Sinn Fein press conference. Once inside, he pulled out a shotgun and opened fire killing three men. He then drove to a secluded spot before taking his own life. When IRA members attacked another RUC station, security forces allowed them to make a futile attempt to storm the heavily fortified building. The IRA members were followed to their get -away-cars and gunned down by the SAS. Then in 1994, an IRA ceasefire was called. As months passed security patrols lessened and the RUC relaxed. Police officers were able to patrol without flak jackets and rifles. Armored cars were replaced by "saloon" cars and motorcycles. In July of 1996, the Orange Order wished to participate in it's annual march. To stop a clash between the Catholics and the marchers. Chief Constable of the RUC banned the march from going along the Catholic Garvaghy Road. To stop the Orangemen from getting through, the RUC barricaded the roads with vehicles, razor wire, and men in full riot gear. When stopped the Orangemen became enraged and riots broke out all across Northern Ireland. The growing number of Orangemen quickly surpassed the number of RUC troops. With no other choice, the RUC let the march continue clearing the road of Catholic protesters. The rough handling of some of these nationalists caused even more rioting to erupt, but when the march was over the commotion ended. The following year saw more violence. An RUC patrol received criticism when it allegedly failed to help a Catholic man from being beaten to death by a loyalist mob. 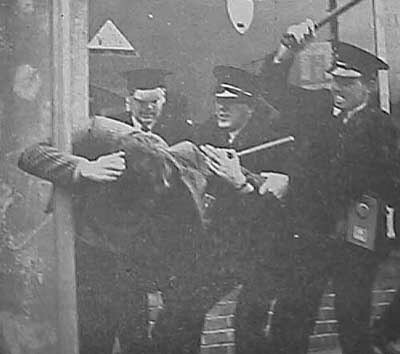 Three weeks later, an RUC officer was killed by loyalists in response to the police attempts to stop the Orange marches. The killings continued even after the Good Friday Agreement was signed. When police tried to ban the Garvaghy Road march of 1998 more riots broke out. The rioting stopped when three young boys were killed after a loyalist petrol set their house on fire. In 2000, many reforms for the RUC were suggested. These included; more Catholic officers, a new human rights ethos, and a change in the name. In 2001 the RUC ceased to exist, and was replaced by the Police Service of Northern Ireland.